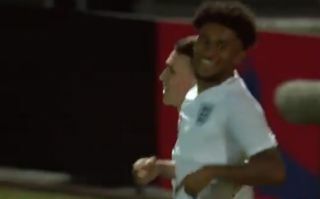 Arsenal starlet Reiss Nelson continued his fine start to the season with a sublime goal on his debut for the England Under-21s. Showing superb imagination to flick in with a close-range back heel, Nelson is showing just what a talent he can be for Arsenal, following on from his fine form on loan at Hoffenheim. The 18-year-old became part of the Arsenal first-team last season, but still looks some way from being a regular starter. Still, if he carries on like this it might not be too long before he forces his way into the plans of Gunners boss Unai Emery. Reiss Nelson goal has made my night a little bit better ?? Get in Reiss Nelson my son!, can't wait to have him in the first team squad next season for Arsenal? ?